Graffiti can often times be artistic and inspiring but too often it is misplaced inappropriate and illegal. D & D Painting for many years has taken a community approach to preserving the natural beauty in our great state of California. 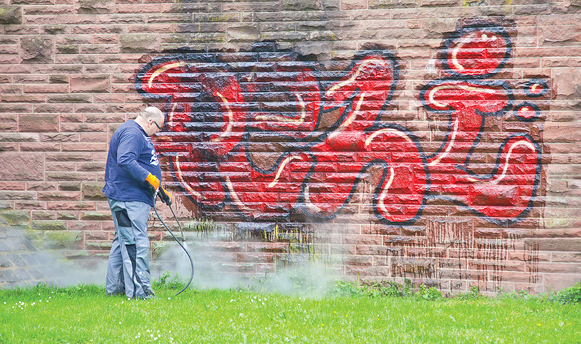 When unwanted or illegal graffiti is present and you need it removed, contact the professionals at D & D Painting. Eric Dokey, the owner/CEO of D & D Painting received an award from Cal Trans and the Department of Transportation in the state of California for his voluntary efforts to combat unsightly and illegal graffiti along the highways near Fremont, CA. Our goal in cleaning, removing and combating graffiti is to keep our neighborhoods and communities clean. Our methods and products are environmentally safe and we can quickly remove most types of graffiti effectively from most building surfaces. Working together with our communities we can help restore the beauty to neighborhoods and highways. Contact D & D today whenever you encounter a problem with graffiti. Service Areas include, but not limited to: Hayward, Castro Valley, San Leandro, San Lorenzo, Alameda, Oakland, San Ramon, Fremont, Newark, Pleasanton,Livermore, Concord, Dublin, Alamo, Lafayette, Orinda, Moraga, San Jose, Santa Clara, Campbell, Los Gatos, Saratoga and South San Francisco. We cover the entire Alameda, Contra Costa, Santa Clara counties and parts of San Francisco and the peninsula.